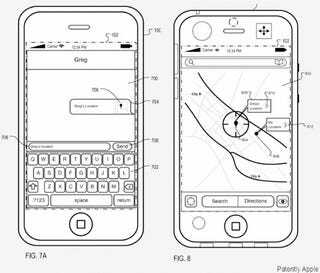 While it was initially suggested that Google Latitude was rejected from the app store to keep iPhone users from confusing it with Maps, this new patent shows that Apple might be working on their own friend- and ex-girlfriend-tracking app. 9to5 Mac points out that the iPhone diagram seems to show a front-facing camera, a feature that we've seen before in such patents and could well make it into the next iPhone. Location Sharing: Abstract - Geographic location data is sent from a first device to a second device with a modified message to signal the presence of geographic location data associated with the message. The message can include (or attach) the geographic location data or file, or the message can include a link to a network-based resource which the second device can use to obtain the geographic location data. In some implementations, when a user of the first device views a location on a map display of the first device, a graphical user interface is presented to allow the user to select an option to share the geographic location with the second device. The second device receives geographic location data or a link from the first device which can trigger a map display on the second device showing the location of the first device and, optionally, the location of the second device.